The term e-book is an abbreviation for electronic book that is available in full text online. Some e-books are older books that are no longer subject to copyright and have been scanned and made available on the web. These older books might be included in a freely accessible database like Google Books. Most recently published e-books are still subject to copyright. Some are made available free online by the organisations that publish them, but in most cases the Library has to pay so that DMU users can access these books. They are subject to Digital Rights Management (DRM), which is copyright protection for an electronic product that limits the duration of the loan of the downloaded e-book, and the amount of copying and printing available. For this reason the option to download an e-book to a bookshelf, and the number of days the e-book will remain on your bookshelf, varies with each provider and on the type of licence (unlimited readers or restricted numbers). Some e-books are not available for download due to publisher restrictions, whilst others can only be downloaded. So be aware that depending on which platform is hosting the e-book, procedures may vary significantly. Typically e-book files will be in either PDF or ePub format. PDF don’t adapt well to various sized displays and devices and therefore it is difficult to view some PDF files on small screens that come with some smartphones, tablets and eBook readers. Therefore ePub has been adopted as the industry standard format as the text reflows to fit the dimensions of the screen. 5. no more library fines! You can find e-books through Library Search, the Library Catalogue, or the e-Resources portal. Tip: Remember to visit the relevant tabs on this guide for help on each platform once you have found an e-book you want to read and established which platform it uses. To find out if there are e-books among your search results on the Library Catalogue, perform your search as normal and look on the left hand side under the heading ‘Collection’. 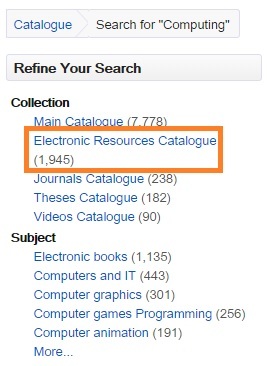 If there is a ‘Electronic Resources Catalogue’ subheading, click on it to display the titles that are available electronically. 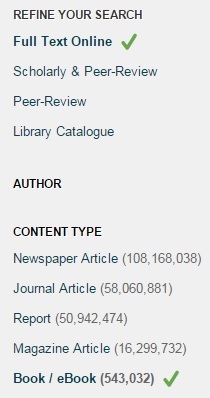 The e-Resources Portal is a way of searching our e-journals and e-book collections. To search for e-books enter your keywords and select 'Books Only'. Bridging the gap between the e-book reader you have and the e-book content you want to use often requires an app or software. The most common free software solution is Adobe Digital Editions. Adobe Digital Editions (ADE) is an e-book management system, providing a way to organise and access your e-book library. It is also a core player in the e-book ecosystem of publishers, sellers and libraries. You will need to download and install the freely available ADE software before you can download and borrow most library e-book content. Adobe Digital Editions allows you to access e-books downloaded to your computer in either ePub or PDF format protected with Adobe Digital Rights Management (DRM). Tip: Where additional readers or apps are needed for individual platforms this will be indicated on the relevant tabs in this guide. Before attempting to download a book please follow these step-by-step instructions to install Digital Editions. These instructions are for downloading to a personal PC or device. For the additional steps needed to download to a DMU or Library PC, see the Tip box below. 1. Visit http://www.adobe.com/products/digital-editions/download.html to download, choose whether to download the Mac or Windows version and click the appropriate link. Follow the on-screen prompts to install Digital Editions. 2. Register for an Adobe account and authorise your device with your Adobe ID. If you already have an existing Adobe ID, open Adobe Digital Editions and follow the instructions in section 3.
a. Go to: https://www.adobe.com/account/sign-in.adobedotcom.html and click the 'Don’t have an Adobe ID?' link. b. Complete the form and scroll to the bottom of the page and click 'Continue'. 3. Activate Adobe Digital Editions with your new Adobe ID. Your Adobe ID is the Email address and password you entered in the above step. The first time you use Adobe Digital Editions, you will be asked to authorise the software with your ID. Should you not receive this prompt, click ‘Help’ and ‘Authorise this Computer’. Create an Adobe account (which is free) if you don't already have one, or sign in if you already have one.